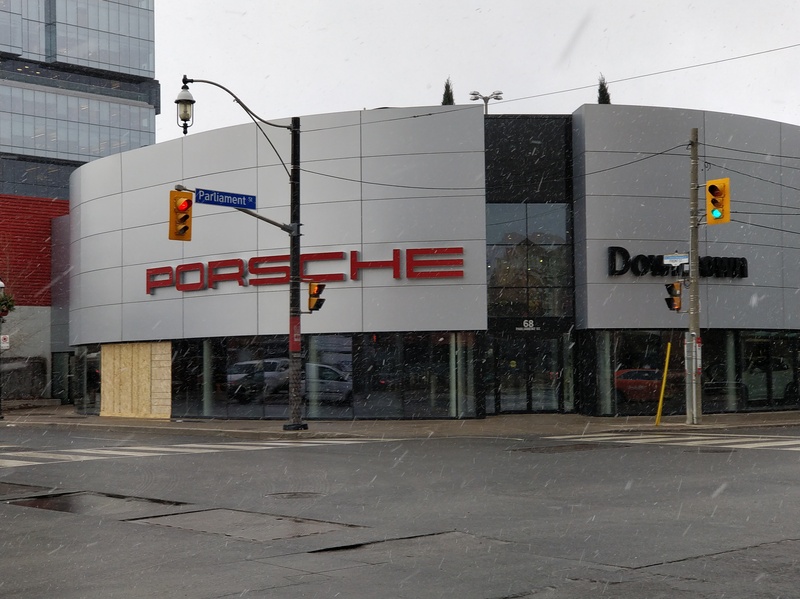 A Porsche dealership in east Toronto got an unpleasant surprise late Monday night. A Toyota Yaris crashed through the dealership's front window and its alleged driver, 20-year-old Rakhmatullo Sotvoldiyev, vandalized several other cars inside, reports Vice. Police say it was because of a bad breakup, but man, the good cars don't deserve this! Several Porsches in the showroom were damaged in the incident, the most noticeable of which was a Panamera that was directly in front of the Yaris. According to the City News, the driver revved the Yaris' engine and roasted its tires after smashing through the window, filling the showroom with burnout smoke. After a full smoke-screen was achieved, he then got out of the car and wrote on several cars with a permanent marker. Another tag on a 718 Cayman had the woman's name "Eve" on it. It is unknown whether Eve is his ex's name. A dealership employee who spoke with the suspect told the City News that Sotvoldiyev said, "I’m just having a bad day." A security guard working at the dealership told City News that he and a cleaner working in the dealership that evening were able to hold the suspect until police arrived. That didn't take long, as a police division headquarters is directly across the street. "Someone called it in, but I think our front desk people who were here, they actually heard it as well," Hoffmeyer told the Toronto Star. No one was injured in the incident but three cars were damaged, per the City News. Police were called to the dealership at around 11 p.m. on Monday, and Sotvoldiyev was taken into custody. 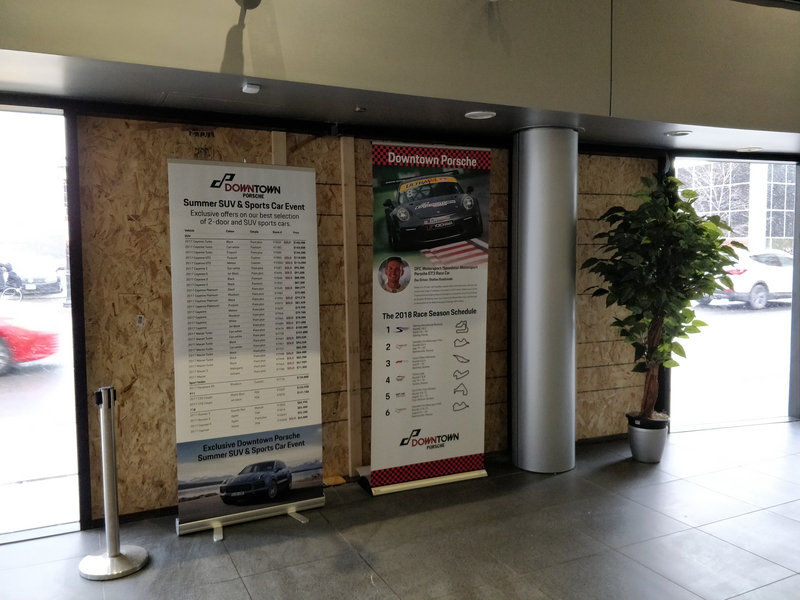 According to police, the crash was deliberate and resulted in $25,000 in damage to the building as well between $50,000 and $75,000 to the cars on the showroom floor. Sotvoldiyev will likely be charged with dangerous operation of a vehicle plus multiple mischief charges. Police also don't believe that Sotvoldiyev held any particular animosity towards Porsches, either. The beige Yaris used in the crash was a recent purchase still sporting Newfoundland license plates, even though Sotvoldiyev lives in Toronto. 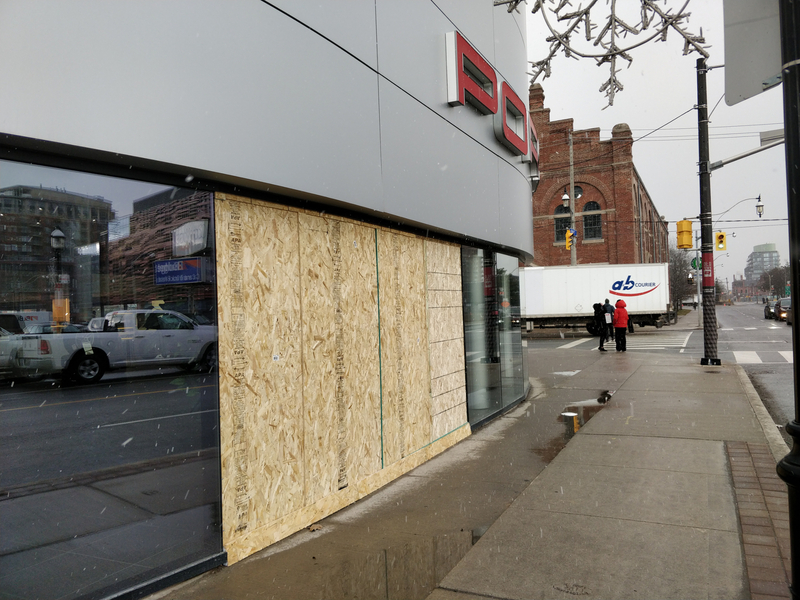 The Drive's Chris Tsui visited the Toronto dealership Wednesday afternoon, and it is now open for business but it's still missing a window. Let me just say that this is a really unhealthy way of getting over a break-up. No one is entitled to someone else's companionship, and if things aren't working out, smashing into a bunch of Porsches to get arrested will only make things worse. Mental health professionals and crisis hotlines are there if you can't process the grief of a bad breakup, or if you think your bad day might lead to hurting yourself, others or a showroom of innocent Porsches.